It's literally love on the streets of Paris! When asked why he decided to start his graffiti, he said - "Before her there was nothing. After her there was room for nothing else". 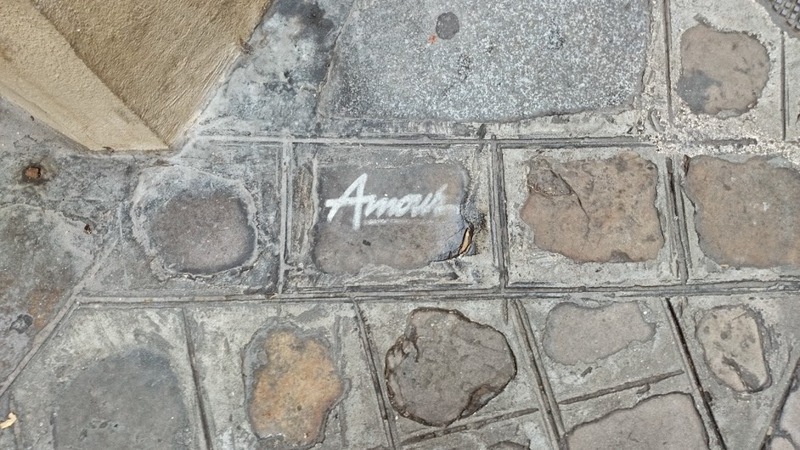 At its peak, 'Amour' was written on walls, streets, Metro stops, benches and pavements 100 times a night across the city. Street cleaners would remove the washable paint and chalk every evening, but they re-appeared day after day. It all started in 2001 when his then girlfriend dumped him after living together for two years. Jean-Luc was so devastated that to woo her back he started spray-painting 'I love you' (Je t'aime) along her route to work and wherever else she may go. Unfortunately his attempts were never successful and she eventually had a court-order put on him so he couldn't contact her for three years! Far from being undeterred, Jean-Luc was encouraged by passers-by who felt the graffiti livened up their day and made them smile. From then, he started writing 'love' rather than 'I love you' - a message for everyone, not just his ex-girlfriend. Has there ever been a better illustration of why Paris is know as the City of Love? Want to try and find your own love in Paris? Check out our experiences in the French capital here.